I am still not a big fan of colour blocking when it comes to arranging my bookshelves (I prefer a more functional approach), but I also can’t deny that it is a striking look, especially in an otherwise neutral room. It *is* very pretty but creates a bit of a problem if you can’t remember the colour of a particular book you’re looking for….! I think the only ones I could shelve in color blocks would be the black & orange Penguins, the cream OUPs and the green Viragos – but many of my books have multi-colored spines. This seems a relatively new fashion fad in the world of books, to colour block like this. I recall, many years ago, someone who covered all the books with white paper covers – how on earth would they know which book was which? 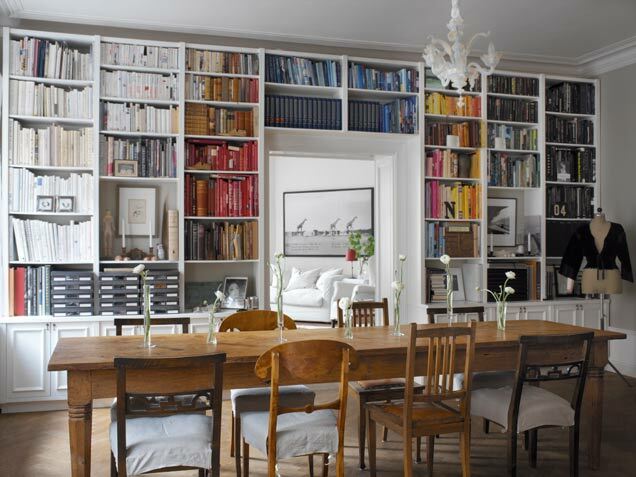 This library looks almost right for me, but as well as not liking colour blocking like this, I’m not keen on white shelves – I like either natural wood or shelves painted an interesting colour – the style of room dictates whether this should be a light duck egg blue, for example, or a rich terracotta. I do like the mismatched chairs which have their opposite number at the other side of the table, and I like the cupboards under bookshelves for two reasons: they visually add ‘weight’, anchoring the books visually, and they are useful for all the things which don’t look attractive on display but which are still necessary. Yes, orange Penguins, silver grey Persephones, and green Viragos look find grouped together, but for the rest, I like my books missed alphabetically by author and/or by subject. To me, it makes all those white books look like nothing at all. 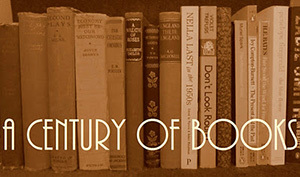 I don’t like color blocking with books. It turns them into inanimate objects – and I never consider them that. I think this looks really nice, but it makes me think the owner doesn’t really care about the books – just about how they can enhance the decor. For once I’m stumped. There is nothing I see about this room that I find pleasing. Color blocking books is just silly – alpha by author, please – and the white shelves, mis-matched chairs at the table, boring carpet, sweater mannequin… all of it is so “meh”. The room is about as cozy as broken pottery.